When I was a first time Mom I distinctly remember going to a La Leche League meeting solely so I could ask them about my son, Mason's eating habits. He was just over one and was eating little to no solids. It didn't seem like he was trying to wean and was absolutely obsessed with Mama's Milk. They explained to me that it was completely normal which I had no idea because it seemed like with all the information I was getting that he should be eating mainly solids and weaning. But the truth is that just because your baby hits one doesn't mean that some magic switch goes off and your baby will stop nursing and start eating a ton of food and wean. My son primarily nursed for the first 18 months of his life. We offered him food but he was just way more interested in mama's milk and he thrived. The more I learned and connected with other breastfeeding moms the more I realized that it was okay and normal! In fact in many parts of the world it would be ABNORMAL if Mason had suddenly weaned himself at a year. Figure 1. 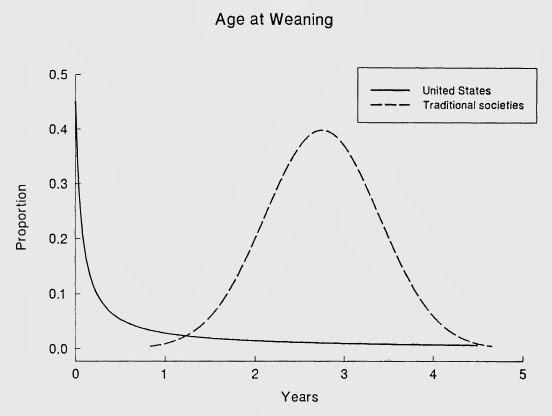 A comparison of age at weaning in the United States and in 64 traditional societies. Reproduced from Stuart-Macadam & Dettwyler (1995). In traditional societies around the world the average age of weaning is around 3 years old. Nursing after a year can be a completely different journey than the first year. At times it may seem like they're weaning but they're most likely not. It's just different breastfeeding a child over the age of one. They're more active than ever before. They're soaking so much in. It may seem like they don't have time to nurse but that will change, it will come and go in stages until one day you've nursed you're little one for the last time and you may not have even realized it was the last time. I don't remember the last time that I nursed Mason when he was a little over 2 years old. We had some special circumstances going on and I was overwhelmed by other things going on in my life and that is something I regret, something I wish I could change. I wish I had a snapshot of that moment, the last time he nursed so that I could save it forever. Sometimes while you're nursing it can seem like it's never going to end that you'll be nursing your child until he goes off to college but that's not the case. It will end but you don't have to rush it, not if you don't want to and certainly not because our society makes us feel like "it's time". It's time when you say it's time.